Aisin Seiki Co., Ltd. (AISIN) and DENSO Corporation (DENSO)have announced that they will be shortly forming a new joint venture company. The company will specialize in the development and sale of driving modules used for electric vehicles. Based on the current timeline, the new company will be established in April 2019 and will be called BluE Nexus. The two companies, Aisin and Denso had announced their basic agreement to set up a joint venture company back in April 2019. Electrification of vehicles requires the use of a driving module package The package normally comprises transaxles, a motor-generators, and inverters. These key components are needed for both partially and fully electric vehicles. 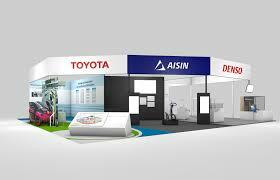 Aisin and Denso will share their expertise in electrification to develop a wide range of driving modules and sell them to automotive manufacturers in Japan and on a global basis. Moreover, BluE Nexus will calibrate these driving modules for the diverse needs automakers have for hybrid vehicles (HVs), plug-in hybrid vehicles (PHVs), and electric vehicles(EVs). The use of such modules will help both automotive manufacturers and consumers to minimize the damage on the environment and to protect the earth from the effects of global warming, atmospheric pollution and shortages of resources and energy.